Summary Broadcom BCM60333-based Homeplug AV2 SISO powerline adapter kit. Rebrand of Tenda P1000. 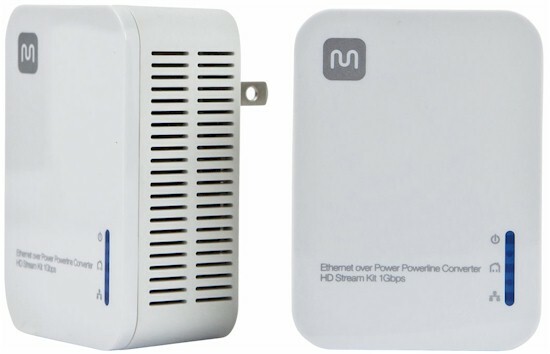 Today I'm looking at Monoprice's Model 12288 Ethernet over Power Powerline Converter - HD Stream Kit 1Gbps. The Monoprice 12288 is one of two SISO class adapters we've reviewed that is based on the Broadcom BCM60333 chipset. The other Broadcom-based SISO adapter is the ZyXEL PLA5206 Kit. The other three SISO adapters are all based on the Qualcomm Atheros QCA7450 / AR1540 chipset. A little sleuthing outed the Monoprice 12288 as a rebranded Tenda P1000. The image below shows an oblique view of each product. While the products appear to be identical, each has its own unique user guide. The image below shows the Monoprice 12288 plugged into the bottom socket of a conventional wall outlet. While you can plug a grounded plug into the top socket, it's a bit tight, as the plug touches the top of the adapter. The Monoprice doesn't have a pass-through power socket. If that's a must-have for you, check the TRENDnet TPL-421E2K and TP-LINK TL-PA8030P-KIT reviews. The image below shows the callouts and LED indicator key for the Monoprice 12288 from the User Manual. You'll find the configuration of the Monoprice adapter is very similar to all other powerline adapters. On the bottom, there's a Gigabit LAN port as well as a button for pairing or factory reset. On the front, there are separate LEDs for Power/Status, Powerline connection/activity status, and LAN connection/activity status. The cover of the Monoprice 12288 was glued on, so we weren't able to disassemble the unit without damaging it. However, we were able to verify the components once we identified the product as a Tenda P1000. To install the Monoprice 12288, you just plug them in. Like other HomePlug AV adapters, they come set with the standard default network name (HomePlugAV) and link right up. If you want your own private network key, just push the pair/reset button for 1-3 seconds on the first adapter and push the pair/reset button on the second adapter within 2 minutes. Either way, traffic is encrypted using 128 bit AES..
You don't really need a utility to manage or set up the basic features. But you can download a Windows utility to control advanced features such as QoS priorities. The short gallery below shows a few screenshots of the utility. Menu for choosing options to change. This shows firmware upgrade. Change the network name (or use the default) for selected devices. You can assign a friendly name to the devices. Current HomePlug AV2 products fall into two categories: SISO (Single-input single output) and MIMO (multiple input multiple output). SISO products were the first to hit the market and, as you might suspect, have lower prices and lower throughput than their MIMO cousins. The image below shows Average Downlink throughput and pricing for SISO products (left) and MIMO products (right). Clearly, there's a performance difference between the two as the top performing MIMO products have approximately 90+ Mbps more average throughput than the top performing SISO products. We tested the Monoprice 12288 using our standard powerline test procedure with all results entered into the Powerline Performance Charts. For this comparison, I chose the top four AV2-SISO products with the highest average downlink throughput. The other products included in the comparison are the TP-LINK TL-PA6010Kit, the Linksys PLEK500, and the other Broadcom-based product, the ZyXEL PLA5206KIT. The Downlink Throughput plot below shows that the Monoprice 12288 had the second best throughput at location A and the third highest at both locations C and E.
The composite iXChariot downlink plot shows steady throughput at locations C and E. Location A had the highest throughput but with significantly more variation. As expected, throughput decreased at more distant locations. Uplink throughput, however, is a different story. The plot below shows that the Monoprice 12288 had the best throughput at location A by a significant margin. Drilling down into the details, it outperformed the second place ZyXEL by ~ 50Mbps. However, it turned in a third place performance at location C and finished last at location E.
The uplink IxChariot plot shows consistent throughput at all locations with throughput decreasing as distance increased. The Monoprice's simultaneous up/downlink IxChariot plot shows very lopsided results with the uplink stream having achieving more than 10 times the average throughput as the downlink stream. While the uplink plot showed a larger variance in the 95% confidence level, its throughput was significantly higher than the downlink, and showed steady throughput. We noted a similar inbalance between the uplink and downlink simultaneous tests on the other Broadcomm-based ZyXEL PLA5206. By comparison, the TP-LINK TL-PA6010 showed only about a two to one inbalance favoring the downlink pair. Since both Broadcom BCM60333-based products exhibit similar behavior, the problem may be caused by how Broadcom manages powerline spectrum use. Adding another simultaneous stream pair gained slightly more than 55 Mbps for a total throughput of 403 Mbps. Again, in this test, the results were very lopsided in favor of the uplink streams. Each of the uplink streams averaged 190 Mbps, where as the combined throughput of the two downlink streams was only slightly above 23 Mbps. Pair 1 was starved for performance averaging only 2.5 Mbps. As with the single pair simultaneous tests, the Broadcomm-based PLA5206 showed a similar inbalance in favor of the uplink streams. Noise tests were run in Location E. In the plot below, the top, blue line shows the baseline throughput test with no noise introduced. The middle green line shows throughput when noise is introduced throughout the entire test. When the noise is removed at 30 seconds into the run, the red plot shows that throughput quickly climbs to the levels in the original "no noise" plot. However, the red and green plots run concurrently at the same throughput levels from about 10 seconds up until 30 seconds when the noise is removed. After 30 seconds, it climbs up to join the baseline blue plot. This indicates that the the adapter hasn't adapted to the noise, but only adapts to the absence of noise. Using the new simplified classing, the Powerline Ranker places the "1 Gbps" Monoprice 12288 tied with the older "AV600" TP-LINK TL-PA6010Kit for #1 rank. This just shows how little the speed / throughput numbers slapped onto these products reflect their real performance. The other Broadcom BCM60333-based Zyxel PLA5206KIT earned a #2 ranking. Rounding out AV2-SISO category, the other two products, based on the same Qualcomm chipset as the TP-LINK, tied for #3. The composite image below shows the Ranker Performance summary for the top three products. Both #1 ranked SISO powerline adapters have two categories ranked #1. The #2 ranked ZyXEL has two categories ranked number two. While we've seen some pricing fluctuation at Amazon on these products (our charts update automatically on a regular basis), a few dollars one way or the other isn't going to change your purchasing decision. However, if your budget doesn't allow you to move up the the AV2-MIMO class adapters to get better performance, I'd recommend the other #1 ranked TP-LINK TL-PA6010Kit. I like the TP-LINK better because its simultaneous uplink/downlink tests were more balanced than the Monoprice's very lopsided results.